Did You Hear Marijuana Caused 32% More Traffic Deaths? Let’s Clear the Air. This report is often cited by government agencies, law enforcement professionals, political groups, and religious groups that favor prohibition, as well as national news outlets and media. The report is biased, and data implications are cloudy and sensationalized. In 2014, when retail marijuana stores began operating, there was a 32% increase in marijuana-related traffic deaths in just one year. ~ Excerpt from the Rocky Mountain High Intensity Drug Trafficking Area Report Final of 2015. A 32% increase in marijuana-related traffic deaths? Wow! You’ve caught my attention. Marijuana must be a dangerous drug! How many people go to a cited report for data, check to make sure the source is legit, then copy and paste the statistics to fit their need? A lot. The data then gets shared all over the web with like-minded individuals. Many people just read the Executive Summary and collate information and opinions from there. The above 32% statistic is the first one listed in the Executive Summary and the first statistic stated under the subtitle “Some Findings” as well. Unfortunately, it is a deceiving statistic and does a disservice to the general public and those seeking the truth about the impact of marijuana legalization in Colorado. Marijuana-Related: also called “marijuana mentions,’ is any time marijuana shows up in the toxicology report. It could be marijuana only or marijuana with other drugs and/or alcohol. ~ Excerpt from the Rocky Mountain High Intensity Drug Trafficking Area Report Final of 2015. Definition of “Marijuana-Related.” The term “marijuana-related” is used in this context throughout the report. It is proven that marijuana remains in the system even after the influence wears off. Can This Rocky Mountain Colorado Marijuana Impact Report Be Taken Seriously? Truth-seeking policy-makers and statisticians evaluating the effects of legalizing recreational marijuana and retail sales of marijuana can see that the “32%” quote is a correlation clouded with variables, and a blatant attempt at journalistic sensationalism. Causation is implied, by beginning the sentence with “the year marijuana retail stores began operating,” but not proved. It is carelessly suggested that marijuana use caused more traffic deaths by the wording “marijuana-related traffic accidents,” without providing the proof needed to determine causation. An increase is mentioned, but there’s no mention of other variables, such as the population and traffic increases, or reporting and testing changes. There are also random quotes and stories throughout the report about the negative effects of marijuana, but none about the positive effects. That’s not saying the 32% statistic is a lie, based on Rocky Mountain’s definition of “marijuana-related,” they covered their tracks well. At any time they can holler “it’s not our fault the reader didn’t read the definitions and made false assumptions.” But to look at the impact of marijuana in Colorado, we need to look at the data in context with known medical facts and acknowledge the multiple contributing factors to events. “Marijuana related” does not mean that marijuana was the cause of the accident, especially in this Rocky Mountain High report. The driver could have had a fifth of whiskey, snorted some cocaine, popped some pills, or simply swerved to avoid a possum, skunk or dog. (Even people willing to run over an animal don’t want the carcass stuck in the undercarriage.) Maybe the driver sneezed. Maybe the roads were icy. (It is Colorado.) The marijuana in the toxicology report could be a fraction of a percent or a small percentage, consumed weeks ago, that had no effect on reaction times. There is no direct causation in this statement, thus, it cannot be used alone as an indicator by anyone seriously looking at the effect of marijuana legalization on marijuana-drugged driving traffic accidents. ~ The data does not prove that marijuana was the cause of the incident. Detecting marijuana does not mean marijuana was the cause of the accident. Particularly when an infinite number of reasons for fatal accidents exist. The 32% summary of “marijuana-related” traffic deaths does not differentiate between the legal and illegal. These toxicology reports of the “32% increase” include people who had marijuana and other illegal drugs in their system. To examine the effect of legalization, you have to separate and examine the legal and illegal. The cohort of individuals who would consume and drive with illegal drugs in their system have been proven to partake in illegal drug activities. They will take drugs whether they are legal or illegal. The illegal drug consumers are not the (generally) law-abiding citizens changing their recreational and driving behaviors because of legalized recreational and retail marijuana. The report later states that 30% of operators testing positive for marijuana had other drugs in their system (not including those who had only pot and alcohol). It would be far-fetched to theorize that legalizing marijuana influenced the decision of this 30% to drive drug impaired. Though alcohol and marijuana are both legal, drivers in a traffic accident with alcohol and marijuana in their system would have likely been in an accident with just alcohol. Given a toxicology report with both alcohol and pot, the pot influence could be null, but the alcohol influence would have been in existence. The majority of these events would have likely happened with or without the pot. Had the Rocky Mountain report compared only reports at legally-impaired levels, a clearer picture could be seen, and the data would have been more relevant. Though the double-dipping alcohol and marijuana drivers are deserving of study, there are scenarios to debate and medical literature to review, the group needs to be set aside and categorized separately to get a more accurate image of the impact of marijuana legalization in Colorado. The Rocky Mountain High marijuana impact report states that 37% of operators that tested positive for marijuana, had marijuana and alcohol in their system. When evaluating the impact of marijuana legalization in Colorado on drugged driving, looking at legally impaired marijuana-only caused crashes provides a clearer picture. Fatal accidents, not the number of fatalities, will show a more accurate picture of drugged driving changes due to marijuana legalization. The 32% quote looks at fatalities—the number of people killed, not the number of accidents. And it uses deaths, rather than crashes, consistently and more often throughout the entire report. If one van with 10 people is hit one year, and all 10 people are killed, but the previous year one car was hit, and only the driver died, fatalities would show a 10% increase, but the number of fatal accidents would remain the same. Until driverless cars are mainstream, the number of fatalities will be higher (or miraculously) equal to, the number of crashes. There are years when the number of crashes go down, but the number of fatalities increase. The number of fatalities are useful for economic analysis and community impact, but the number of accidents are a more accurate indicator of the impact of legalizing recreational and retail marijuana on drugged driving. Figure 4. DUI and DUID Fatal and Injury-Causing accidents have decreased since 2011 (after the advent of legalizing recreational and retail marijuana). We’re not going re-create the RMHIDTA report with a pro-legalization spin in this article, but let’s take a quick look at some 2014 drugged-driving statistics to get a glimpse of reality from a more reliable source. 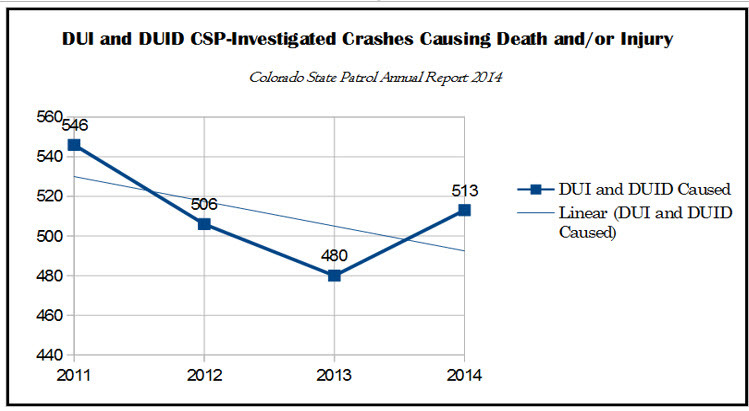 A Colorado State Patrol Department 2014 report comparing accident causes, shows only a comparative half-percent increase for DUI and DUID caused fatal accidents and injuries from 2013 to 2014. Figure 5. A graph with data from the 2014 Colorado State Police report on DUI and DUID caused accidents shows the impact of marijuana legalization has not caused crash levels to increase over the pre-legalization year of 2011. The CSP annual report states there was a 6.9% increase in DUI and DUID fatal and injury crashes from 2013 to 2014, but the number of accidents is still lower than 2011, the year before legalizing recreational marijuana. There was surprisingly a drop from 2012 to 2013, the first year recreational marijuana was legalized in Colorado. Looking at longer trends, we see that even with the 2013 to 2014 increase, the number of crashes did not reach the higher levels of the pre-recreational legalization year. Longer trends are more indicative of the impact of marijuana in Colorado than shorter trends. The Rocky Mountain High Intensity Drug Trafficking Area report on the impact of marijuana in Colorado has interesting sources, but it only provides a slanted, often deceiving view. Journalists, radio personalities, and fact-finding websites have found blatant errors and sensationalist reporting reminiscent of the Drug Wars, Reefer Madness, and Alcohol-Prohibition eras. It is clearly a biased voice against marijuana legalization. Dangerously, our government officials, law enforcement professionals, health professionals and politicians use this report, take numbers and statistics out of context, and forget Statistics 101—correlation does not mean causation. The authors of the RMHIDTA report are counting on readers to forget the lessons of Statistics 101. Serious policy makers seeking the truth will blow the smoke away, look at causations and correlations, and help keep the public informed about the real impact of marijuana in Colorado. >Are Colorado Marijuana Citations High Enough? >How Do Proactive Citations Help Accidents? >Is it Dangerous to Drive in Colorado? >Did DUIs Increase in Colorado After marijuana Became Legal? >A 32% increase in marijuana-related traffic deaths? Wow! >Can This rocky Mountain Colorado Marijuana Impact Report be taken seriously?